Author Robert L. FitzPatrick, Pres. of Pyramid Scheme Alert has published an eye-opening, succinct exposition of the realities of “multi-level marketing.” The newly published booklet is a distillation of years of research, expert-witness court testimony and consumer activism by the author and other experts in law, marketing, cultism and financial fraud, as well as the experiences of many courageous whistle-blowers. 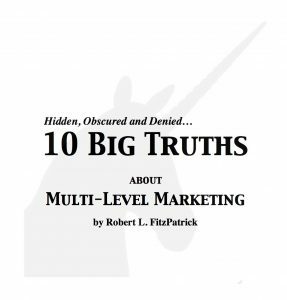 Entitled “10 Big Truths about Multi-Level Marketing, Hidden, Obscured and Denied,” the booklet moves beyond conventional analyses of “MLM” to a deeper understanding of the “MLM” phenomenon sweeping the country and the world. “10 Big Truths” pierces the facade of “direct selling.” It reveals how money is actually gained in MLM and transferred to top recruiters and company owners; why people “buy” MLM products and then soon stop buying them; what percentage of people are ever “profitable” and how long people remain in MLM after being recruited. It explains the full costs of involvement in MLM, the role of government regulation and law enforcement, and how MLM affects family and social relationships and the goals and dreams of individuals. For those confronted by MLM’s extraordinary promises about income and freedom and the competing claims of hundreds of MLMs to be a pathway to success and happiness, this booklet offers clarity, fact, and reality. 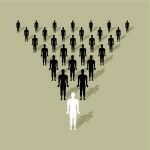 “10 Big Truths about Multi-Level Marketing” is now directly as a PDF on this site. All proceeds are used to support the Pyramid Scheme Alert website. Just make a $10 donation and the report will be emailed directly to you. Click the link below. Thanks. It is also available on Amazon.com as an e-book for reading on Kindle or other e-reading devices.